Chichijima (父島, "Father Island"), formerly known as Peel Island and in the 19th century known to the English as part of the Bonin Islands, is the largest island in the Ogasawara archipelago. Chichijima is about 240 km (150 mi) north of Iwo Jima. The island is within the political boundaries of Ogasawara Village, Ogasawara Subprefecture, Tokyo, Japan. Around 2,000 people live on its land area of 24 km2. The first European discovery of the Bonin Islands is said to have taken place in 1549 by the Spanish explorer Bernardo de la Torre. Archeological excavations show that Micronesians lived on the island in the past, though no details are yet known. The Tokugawa Shogunate dispatched an expedition in 1675 and made a map of the island. It remained uninhabited until May 1830. A whaling ship established an American colony in 1830. Naturalist William Stimpson of the Rodgers-Ringgold North Pacific Exploring and Surveying Expedition came in 1854. Two shipwrecked sailors who were picked up by Beechey in 1827 suggested that the island would make a good stopover station for whalers due to natural springs found on the island. The first settlement on the island was established in May 1830 by 36-year-old Massachusetts native Nathaniel Savory along with four other whites and 20 Hawaiian men and women from Oahu. Descendants of Nathaniel Savory continue to live on the island to this day. Commodore Perry's flagship Susquehanna anchored for 3 days in Chichijima's harbor on June 15, 1853, on the way to his historic visit to Tokyo Bay to open up the country to western trade. Perry also laid claim to the island for the United States for a coaling station for steamships, appointing Nathaniel Savory as an official agent of the US Navy and formed a governing council with Savory as the leader. On behalf of the US government, Perry "purchased" 50 acres (200,000 m2) from Savory. On January 17, 1862, a Tokugawa Shogunate ship entered a harbor at Chichijima and officially proclaimed Japanese sovereignty over the Ogasawara Islands. Japanese immigrants were introduced from Hachijōjima under the direction of the Tokugawa Shogunate. Forty members of the Savory colony were allowed to stay on the island. Following the Meiji restoration, a group of 37 Japanese colonists arrived on the island under the sponsorship of the Japanese Home Ministry in March 1876. The island was officially incorporated into Tokyo Metropolis on October 28, 1880. Emperor Hirohito made an official visit to the island in 1927, aboard the battleship Yamashiro. A small naval base had been established on Chichijima in 1914. The island was the primary site of long range Japanese radio stations during World War II, as well as being the central base of supply and communication between Japan and the Bonin Islands. As behooved this status it had the heaviest garrison in the Nanpō Shotō. According to one source: "At the time of the Japanese attack on Pearl Harbor an Army force of about 3,700-3,800 men garrisoned Chichi Jima. In addition, about 1,200 naval personnel manned the Chichi Jima Naval Base, a small seaplane base, the radio and weather station, and various gunboat, subchaser, and minesweeping units." The garrison also included a heavy artillery fortress regiment, it was a frequent target of US attacks. A young George H. W. Bush was shot down while on one of these raids. In 1944, all of the 6,886 civilian inhabitants were ordered to evacuate from the Ogasawara islands. Japanese troops and resources from Chichijima were used in reinforcing the strategic point of Iwo Jima before the historic battle that took place there from February 19 to March 24, 1945. The island also served as a major point for Japanese radio relay communication and surveillance operations in the Pacific, with two radio stations atop its two mountains being the primary goal of multiple bombing attempts by the US Navy. Chichijima was also the subject of a book by James Bradley entitled Flyboys: A True Story of Courage, a factual account of the lives of a group of young World War II pilots, including George H. W. Bush. The book tells the story of United States Navy pilots who bombed the island's two radio stations, and details the stories of the US pilots who were captured, tortured, executed, and in some cases, partially eaten in February 1945. The island was never captured, and at the end of World War II, some 25,000 troops in the island chain surrendered. 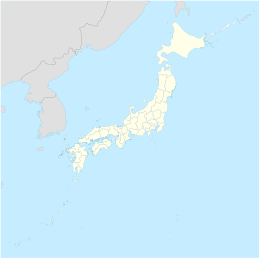 Thirty Japanese soldiers were court-martialled for class "B" war crimes, primarily in connection with the Chichijima incident and four officers (Major Matoba, General Tachibana, Admiral Mori, and Captain Yoshii) were found guilty and hanged. All enlisted men and Probationary Medical Officer Tadashi Teraki were released within 8 years. At least two US citizens of Japanese descent served in the Japanese military on Chichijima during the war, including Nobuaki "Warren" Iwatake, a Japanese-American from Hawaii who was drafted into the Japanese Imperial Army while living with his family back in Hiroshima. The United States maintained the former Japanese naval base and attached seaplane base after the war. After World War II, the Supreme Commander of the Allied Powers allowed only 129 locals of Western origin to go back to the island, and destroyed the rest of the housing. In 1960, the harbor facilities were devastated by tsunami after the Great Chilean earthquake. Several Japanese islands, including Chichijima, were used by the United States in the 1950s to store nuclear arms, according to Robert S. Norris, William M. Arkin, and William Burr, writing for the Bulletin of the Atomic Scientists in early 2000. This is despite the Japanese Constitution being explicitly anti-war. Japan holds Three Non-Nuclear Principles. The island was returned to Japanese sovereignty in 1968. Chichijima is located at 27°4′0″N 142°12′30″E﻿ / ﻿27.06667°N 142.20833°E﻿ / 27.06667; 142.20833Coordinates: 27°4′0″N 142°12′30″E﻿ / ﻿27.06667°N 142.20833°E﻿ / 27.06667; 142.20833. Currently around 2,000 people live on the island, and the island's area is about 24 km2. On English maps from the early 19th century, the island chain was known as the Bonin Islands. The name Bonin comes from a French cartographer's corruption of the old Japanese word 'munin', which means 'no man', and the English translated it to "No mans land" islands. 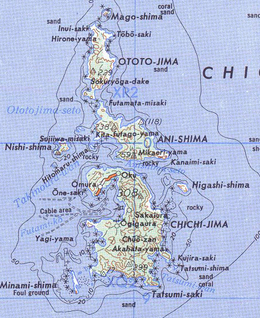 The climate of Chichijima is on the boundary between a tropical savanna climate (Köppen Aw), a tropical rainforest climate (Köppen Af), and a humid subtropical climate (Köppen Cfa). Temperatures are warm to hot and humid all year round, and have never fallen below 9.2 °C (48.6 °F) or risen above 34.1 °C (93.4 °F) owing to the warm currents from the North Pacific gyre that surround the island. Rainfall is, however, less heavy than in most parts of mainland Japan, since the island is too far south to be influenced by the Aleutian Low and too far from mainland Asia to receive monsoonal rainfall or orographic precipitation on the equatorward side of the Siberian High. Occasionally, very heavy cyclonic rain falls, as on 7 November 1997, when the island received its record daily rainfall of 348 mm (13.7 in) and monthly rainfall of 603.5 mm (23.8 in). 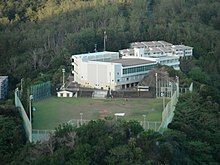 The Japanese National Institute of Natural Sciences (NINS) is the umbrella agency maintaining a radio astronomy facility on Chichijima. Since 2004, the National Astronomical Observatory of Japan (NAOJ) has been a division of NINS. The NINS/NAQJ research is on-going using a VLBI Exploration of Radio Astronomy (VERA) 20-m radio telescope. The dual-beam VERA array consists of four coordinated radio telescope stations located at Mizusawa, Iriki, Ishigakijima, and Ogasawara. The combined signals of the four-part array produce a correlated image which is used for deep space study. Japan Aerospace Exploration Agency also maintains a facility on Chichijima. The Ogasawara Downrange Station at Kuwanokiyama was established in 1975 as a National Space Development Agency of Japan facility. The station is equipped with radar (rocket telemeter antenna and precision radar antenna) to check the flight trajectories, status, and safety of rockets launched from the Tanegashima Space Center. From 1968, the Maritime Self-Defense Force has operated the Chichijima Naval Base, along with the associated Chichijima Airfield, the latter including a heliport originally built during the American occupation, as well as seaplane facilities. Possibly as a result of the introduction of nonindigenous animals, at least three species of birds became extinct: the Bonin nankeen night heron, the Bonin grosbeak (a finch), and the Bonin thrush. The island was the only known home of the thrush and probably the finch, although the heron was found on Nakōdojima (also "Nakoudo-" or, erroneously, "Nakondo-"), as well. The existence of the birds was documented by von Kittlitz in 1828, and five stuffed thrushes are in European museums. The Bonin wood-pigeon died out in the late 19th century, apparently as the result of the introduction of alien mammals. The species is known to have existed only on Chichijima and another island, Nakōdo-jima. The inhabitants of the island traditionally have caught and consumed green turtles as a source of protein. Local restaurants serve turtle soup and sashimi in dishes. In the early 20th century, some 1000 turtles were captured per year and the population of turtles decreased. Today in Chichijima, only one fisherman is allowed to catch turtles and the number taken is restricted to at most 135 per season. The Fisheries Agency and the Tokyo Metropolitan Government operate a conservation facility on the edge of Futami Harbor. Eggs are carefully planted in the shore and infant turtles are raised at the facility until they have reached a certain size, at which point they are released into the wild with an identification tag. Today, the number of green turtles has been stabilized and is increasing slowly. The original settlers were of Western and Polynesian origin. Their descendants are now known as okibei and have Western and Japanese names; they were required to have the latter since World War II. As of 2012[update] most residents were of Yamato Japanese who came to the island after Japan took back control from the US in the 1970s. Ogasawara Village operates the island's public elementary and junior high schools. Tokyo Metropolitan Government Board of Education operates Ogasawara High School on Chichijima. Wikimedia Commons has media related to Chichijima Islands. ^ Welsch, Bernhard. (2004). "Was Marcus Island Discovered by Bernardo de la Torre in 1543?" Journal of Pacific History, 39:1, 109-122. ^ New York Herald Tribune "..first piece of land bought by Americans in the Pacific"
^ Welch, JM (April 2002). "Without a Hangman, Without a Rope: Navy War Crimes Trials After World War II" (PDF). International Journal of Naval History. 1 (1). §Cannibalism. Retrieved 2007-12-03. ^ Bowermaster, David (2009-12-05). "Dolphin dances, WWII relics in blissful, remote Japanese islands". Seattle Times. Retrieved 2009-07-31. ^ Ogasawa, VERA astronomy station. ^ NAOJ folded into NINS (2004). ^ Fackler, Martin (2012-06-10). "A Western Outpost Shrinks on a Remote Island Now in Japanese Hands". The New York Times. Retrieved 2018-03-08. ^ "学校教育." Ogasawara, Tokyo. Retrieved on March 8, 2018. ^ "小笠原村立小笠原中学校". www.ogachu.que.ne.jp (in Japanese). This page was last edited on 2 March 2019, at 15:11 (UTC).